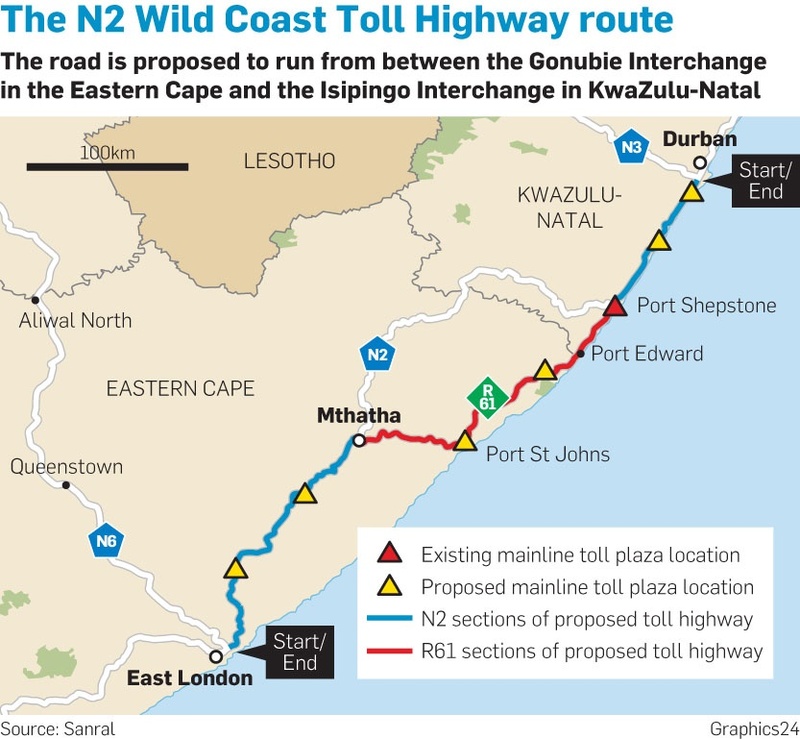 Transport Minister Bonginkosi “Blade” Nzimande is concerned that the R9.5 billion N2 Wild Coast Toll Project in the Eastern Cape is being blocked by a matter that could take some time in the courts to resolve. The minister was referring to the Aveng-Strabag joint venture (ASJV), which withdrew its contract to build the R1.6 billion Mtentu bridge owing to violence and unrest in that area, and the subsequent court battle between ASJV and the South African National Roads Agency (Sanral), in which the roads agency obtained a favourable ruling. During an interview at Lambasi village in Lusikisiki, where the minister had called an imbizo with the communities living in the OR Tambo and Alfred Nzo municipalities, through which the N2 Wild Coast Toll Project will pass, he said it was unfortunate that the main contractor had pulled out and wanted to charge them more money. “We have won the case. But they have appealed. We hope that we will win it again – otherwise we will end up spending a lot of money that should go to the project’s budget instead of spending it on court battles and paying for work that has not been done,” said Nzimande. The R9.5 billion project was one of the largest infrastructure projects in the country and the Eastern Cape was going to benefit, he said. “We are expecting that over the next five years it will create about 8 000 jobs and it’s a project that would in the end cost over R9 billion, and we hope that at least R3 billion would be spent here [on the Mtentu and Msikaba megabridges] with communities, businesses and cooperatives benefiting from the change in these areas, and it would also help to promote tourism,” he said. Nzimande said that he had gone to Lusikisiki to listen to communities and had called for them to support the project. He said those who disrupted it were opportunists who wanted to benefit from the development themselves, rather than allowing the communities to benefit. The minister, who was on his second visit to the area, said he and the government were committed to engaging with all stakeholders and everyone who was affected in order to find solutions. “I am not saying that as the department of transport we have a magic wand, but one of the things I have realised is we have been too far away from the project. We want to get very close to the project and be able to deal with all the problems, whether they are political, economic or community problems. That is important. “I am convinced that with these engagements we will be able to unlock the project ... it must be a lesson to us and our communities. Let’s protect these projects because they are about our livelihoods, not about anything else,” Nzimande said. Mbulelo Peterson, Sanral regional manager, said the Mtentu bridge contractors had indicated they would appeal and Sanral was waiting for them to file their court papers so they could also respond. “We are just happy that we won in court. Now the ball is in the court of the contractor for their next move but we are ready for it. As soon as they file their papers we are going to challenge the appeal and we are quite sure that we will again be successful,” Peterson said. He mentioned that it would be ideal to get another contractor on site, but that it was not up to them as they had to wait for the processes, which have since unfolded, to take place. “Sanral really wants to have a contractor on site as soon as possible because we are aware of the issues that the communities are facing. Some of them were already working and now they are unemployed again and that has affected them negatively,” he said. Ayanda Notshweleka, chairperson of the local business chamber, said there wasn’t much of benefit from the project for small businesses and contractors. “This is because the nature of the project itself is highly technical, with exact specifications. But we are hoping that, as we move forward with small projects and integrated sections, such as road sections, more of our members will benefit. “So far we are not really comfortable. We believe there is more work that the implementing agent needs to do to protect small business. Small businesses need to be protected from clients because you are competing with established businesses. Moreover, the Wild Coast is underdeveloped and lacks skills, so we are calling for intervention from the implementing agency and government to give direction,” he said. The project, which entails a 410km stretch of road from East London to the Mtamvuna River on the border of the Eastern Cape and the KwaZulu-Natal provinces, has been under way since 2011, with the major greenfields portion of the route between Port St Johns and Port Edward having started in 2016. It is estimated that the roll-out of the project will boost the local economy and the construction industry by some R1.5 billion. The construction work will create 8 000 full-time equivalent direct jobs and between 16 000 and 18 000 indirect jobs. The greenfields portion of the project entails 112km of new greenfield alignment between Ndwalane [near Port St Johns] and the Mtamvuna River [between Mzamba and Port Edward], including two megabridge structures on the Msikaba and Mtentu Rivers; seven additional major river bridges and several interchange bridges; about 96km of new class 1 roads; and 17km of brownfield class 1 roads. The remainder comprises the upgrading of the existing roads [already under way] and the future construction of bypasses at the towns of Mthatha, Idutywa and Butterworth. Once completed, the route will be between 69km and 85km shorter than the current N2 and R61 routes, respectively, and up to three hours faster, particularly for heavy freight vehicles. The shorter, flatter and faster route will result in a time-cost saving of about R1.5 billion per annum to the economy for traffic utilising the current N2 and R61 routes, as well as the stimulation of major local and regional economic development. Eastern Cape Premier Phumulo Masualle said that the completion of the project would transform the lives of local communities. “We look forward to engaging with communities so that whatever obstacles surface can be dealt with expeditiously to avoid delays,” he said.